Una Nuova interessante maniera per controllare la tua telecamera è stata introdotta in una delle ultime versioni: modalità sensore. Dopo aver attivato la funzione la telecamera potrà essere mossa tramite l'accelerometro presente nel tuo device! Passaggio 2. Ti mostrerà una lista di applicazioni abilitate ad inviare il tuo backup, in questo caso, utilizzerò Gmail. Dopo questo, si tratterà di comporre una classica mail (con Gmail ovvviamente), perfavore notare che tutte le telecamere esportate sono all'interno di un hyper link criptato (alla fine della mail), proprio come un file allegato in formato testo. E' per questo che devi fare attenzione a chi manderai la mail, perchè chiunque abbia il file e la mia app installata sarà in grado di accedere alle tue telecamere! Passaggio 3: Importare il backup. Aprire la mail, potrai sia scegliere il link nella mail, oppure scaricare il file allegato (per Android versione 4 solamente), il tuo device dovrebbe chiederti come completare l'azione. Ecco fatto. Le telecamere da un device Android potranno essere trasferite ad un altro! 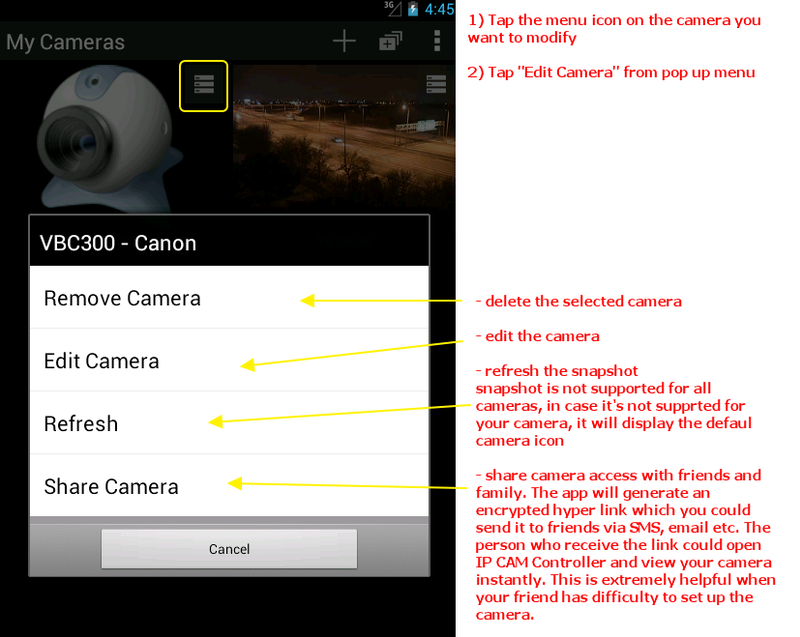 Before today's update (IP CAM Controller Android v1.8) if you want to back-up your camera, the only option is to use share function to share your camera via a virtual hyper link one by one. The good news is that now you can backup your camera in the same way but this time you can export all cameras. Let's see how it works. 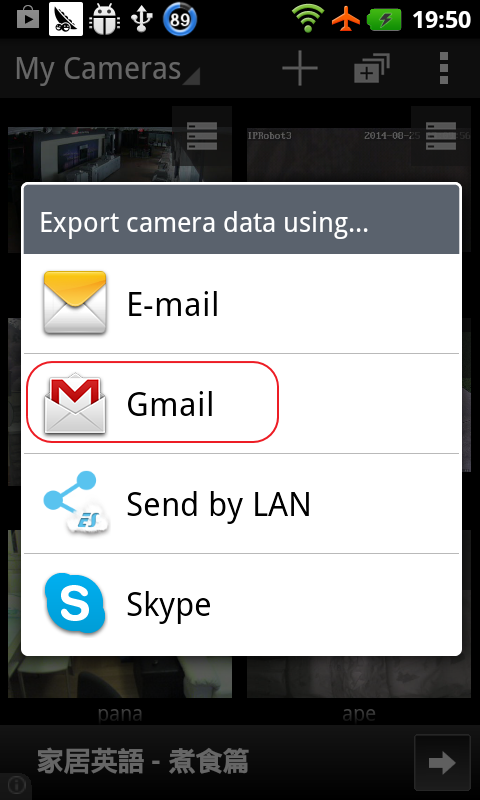 After that, it just like composing an ordinary email (with Gmail of course), please note that the exported cameras are inside an encrypted hyper link (at the end of the email),as well as a file attachment with your setting in plain text. 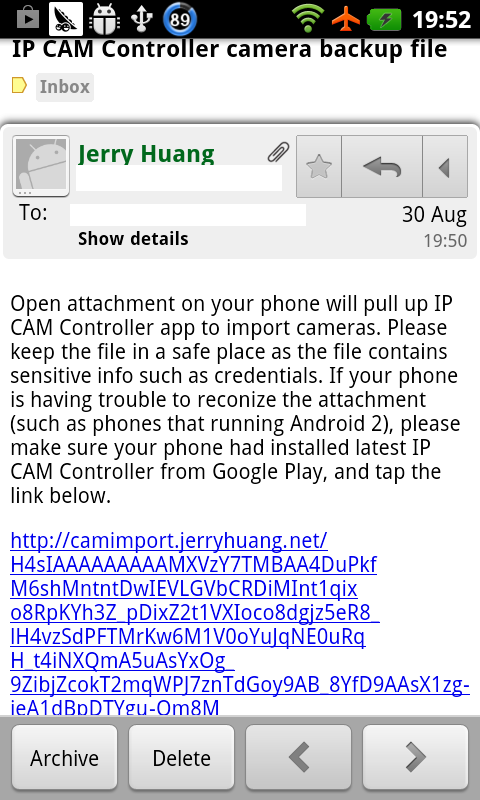 And that's why you have to be caution whom the email is sending to - because whoever have the file and installed my app will be able to access to your cameras. Step 3: Import. Open up the email, you can either tap on the link in the email or download the file attachment (for Android 4 users only), your phone should be asking how to complete the action. 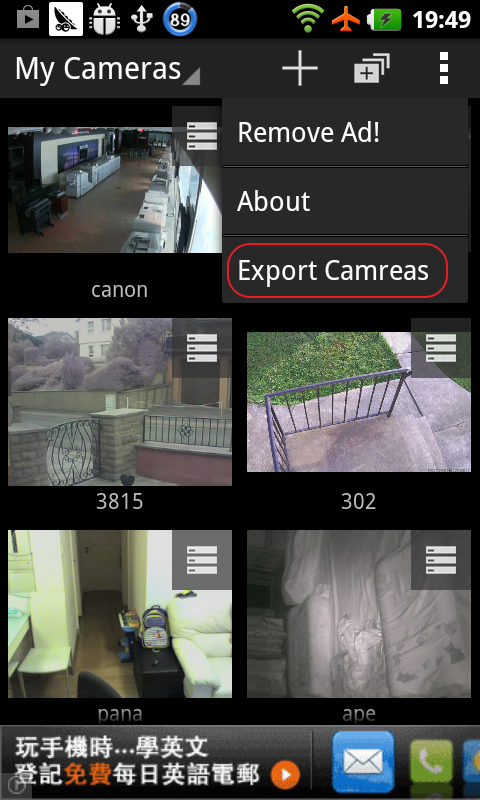 Tap IP CAM Controller, my app will promote a warning to ask whether you would like to proceed, as this will clear out all your existing (if any) cameras. Aggiornamento: il periodo di test è completato, adesso tutti potranno scaricare la versione 1.6 con supporto video HD dal Play Store. La prossimi versione Android di IP CAM Controller sarà equipaggiata con motore H264, in altre parole, saremo in grado di avere video in HD se la tua telecamera supporta formato H.264. Per scaricare la versione beta, si prega di fornire anche il tuo account Google nel messaggio che stai per inviarmi. Attualmente mi sto concentrando su Foscam serie H.264, se avete altri tipi di telecamera, potete contattarmi per vedere se possibile aggiungerle, ma vi prego di notare che sarà necessario accedere alla vostra telecamera in funzione, quindi prima di contattarmi, consiglio di puntarla verso un muro o mettere un grande libro davanti alla telecamera, se la violazione della privacy vi preoccupa. US has been the biggest market in basically all major app stores (i.e. 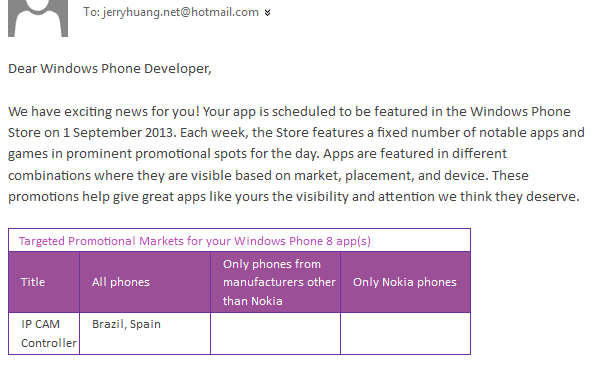 Apple, Google and Microsoft's WP market). And so naturally US is the top country in download number of my app on WP market(it still is ); it was the same for Android. But recently it had been exceeded by German! What a surprise! The next Android version of IP CAM Controller will be equipped with a H.264 engine, in other word, we are able to get HD video working if your camera support H.264. In order to download the beta, please also provide your Google Account in the message you're going to send me. Currently I'm focusing on foscam H.264 series, however if you have other type of camera, you can contact me to see if possible to add your camera as well, but please note I will need to access to your camera to work that out, so before contacting me, I will recommend you turn your camera toward a wall or put a large book in front of your camera if privacy concerns you. As promised, we are aggressively working on audio support for more cameras. In the Android release of v1.4.1, audio is available for Toshiba IK-WP series (such as IK-WP41A) and some new Foscam H264 series (FI8602W, FI8608W, FI8620, FI9820W). 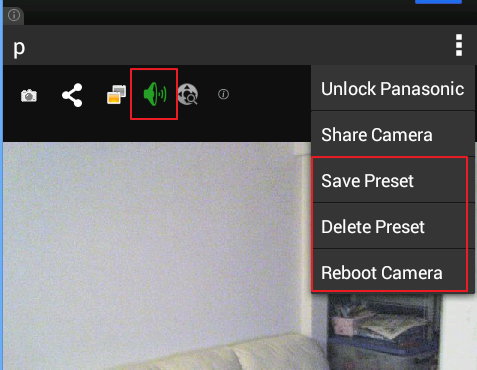 I'm very glad to announce that Android IP CAM Controller now has the ability for audio support, although I have to emphasize that this is just a start point, as at the moment just Panasonic camera is supported (because I own one Panasonic ). IP CAM Controller is now in Japanese! Thanks to our lovely Japanese translator - Xu Zewei - a handsome Chinese student (BTW he's single at the moment ) who is studying in Japan, the latest Android IP CAM Controller has support for Japanese! In addition to Japanese support, this version align with WP version (as promised:)) - Changing PTZ behavior from "double tapping" to "auto stop moving" for those "keep moving" style cameras, such as: Foscam, EasyN, Tenvis, Sony, Bosch, X10. Launching the app at the first time, it will automatically navigate to create new camera screen. 1) Choose a camera type most close to your IP Camera; sometimes you need to try all types of your brand, e.g. 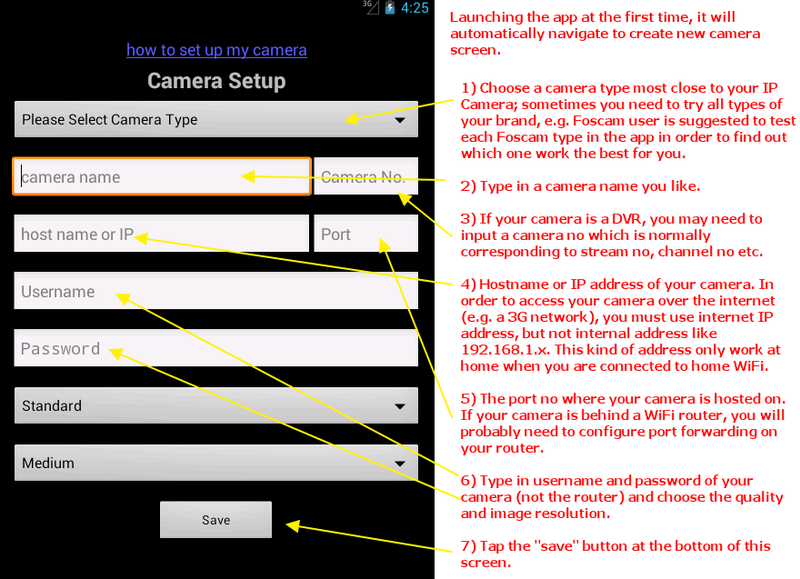 Foscam user is suggested to test each Foscam type in the app in order to find out which one work the best for you. 2) Type in a camera name you like. 3) If your camera is a DVR, you may need to input a camera no which is normally corresponding to stream no, channel no etc. 4) Hostname or IP address of your camera. In order to access your camera over the internet (e.g. a 3G network), you must use internet IP address, but not internal address like 192.168.1.x. This kind of address only work at home when you are connected to home WiFi. 5) The port no where your camera is hosted on. If your camera is behind a WiFi router, you will probably need to configure port forwarding on your router. 6) Type in username and password of your camera (not the router) and choose the quality and image resolution. 7) Tap the "save" button at the bottom of this screen. 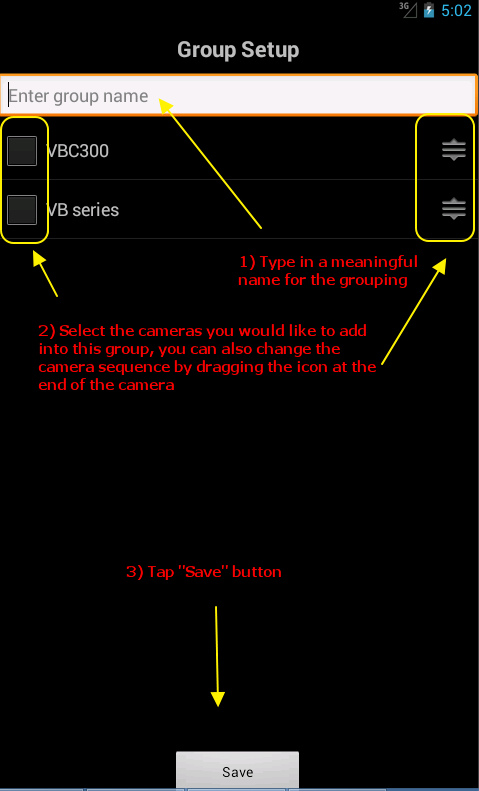 Then you will enter the camera setup screen again, just do the same as you set up the first camera, and don't forget to tap the "save" button to save it. There is a menu icon on the right upper corner of each camera in main screen, tap on that and select "Edit Camera" to edit the camera; or "Remove Camera" to delete a camera. share camera access with friends and family. The app will generate an encrypted hyper link which you could send it to friends via SMS, email etc. The person who receive the link could open IP CAM Controller and view your camera instantly. This is extremely helpful when your friend has difficulty to set up the camera. Click here for more info about sharing.